The author of a new climate study commissioned by the Federal Government says people in southern parts of Australia can expect the dry weather in many areas to continue indefinitely. The study by Australian National University (ANU) professor Will Steffen looked at scientific papers published since the Inter-Governmental Panel on Climate Change's last major report in 2007. He found there is growing evidence that prolonged dry spells in certain parts of Australia are linked to climate change rather than nature. "The situation is becoming clear: I think we can say with some degree of confidence now that the drying in south-west Western Australia, the one in which Perth is suffering from, has a strong climate change signal so it's going to be with us for some time," he said. He says the situation is similar in south-east Australia. "We are also now starting to see a signal we think in the southern part of south-east Australia, that is the southern half of South Australia and Victoria," he said. "The pronounced drying we have seen over the last decades appears to have a climate change signal in it as well, so there is a risk that that will continue for some time." Just a quick question, but I cannot remember the man who said this, but my grandparents etc... keep telling me that this man said there would be a 10-year drought starting in the year 2000. So far he is right and I guess this is the last year for it to be down.... I am hopeing so much. Does anyone know who that man was? Anthony, do you really not believe in global warming??? Let's not get into a debate. BTW looks like Melbourne will have it's warmest July nights on record (though admittedly with a sizable UHI). Also looks like we may end the month with 30 days above average and 1 day below average. I'ld guess in Ferny Creek the split is closer to 27 to 4. BTW Alexia, I understand that Indigo's forecasts were published in something like the RACV newsletter - did stumble across them once. Anyway, had a friend (a stats "nerd" - now a professor at Monash) who did a rigorous assessment of their skill. Turns out there wasn't any that he could find. His forecasts for drought and flood years showed no systematic consistency with what actually occurred. No DJ i dont...and my reasons are simple. We are using a microscopic amount of data compared with our 4.6billion year history. No one knows enough to accurately say its one or the other. Until i see someone rise from the dead from 100 million years ago and let me know how it was back then, then this is what we get. All this is very normal IMO..
Yeah, but big shifts in global climate throughout the history of the earth have always been linked to some other natural phenomena like solar radiation cycles, volcanic activity, tectonic shifts etc. ,some sort of major event like an asteroid hitting the earth, or some other geographical event and the link can usually be found. Seeing a sudden major rise in global temperatures and a sudden and severe shift in climate in a short period of time and the only thing we can positively link it to (in a scientific sense) is increased CO2 emissions from human activities is very damning. None of the other events that I mentioned above seem to be occurring which could cause the rising tempertaures and climate change. Also the fact that certain shifts in climate (like our drying climate here) are being modeled by climate scientists and it is all happening as they have predicted it to, (although much more rapidly), is also damning. Havent we cooled every year since 2002? Despite CO2 emissions increasing the planet is cooling...maybe i am just dumb..
A word of advice to all people who believe in Global warming....have a read of Heaven and Earth by pilmer. No one will take him on because he is right. medieval warm period...2 degrees warmer than today...800 years ago. Geuss what? CO2 has an 800 year lag behind the earths climate....repeat..THE EARTH WAS AN AVERAGE OF 2 DEGREES WARMER THAN TODAY..
Then, with simple logic, we take a look at our earth rotation through our galaxy...not just orbiting in a circular motion horizontally, but vertically as well..Hmmm, then what happens? Hang on, i will think of it...oh yes, thats what happens, our weather changes. It happens ever 1.4 million years, but its cool, use the last 100 years as a reference point. And oh yeah, just further, have a read of this....and get familiar with the term little ice age because we are about to enter one..
Had a crap week, time to release..
>Havent we cooled every year since 2002? Despite CO2 emissions increasing the planet is cooling...maybe i am just dumb..
June 2009 was the warmest on record for the southern hemisphere. It also saw the warmest oceans temperature on record and the August has seen this repeated. The satellite data show July to be the second warmest on record - the only warmer July was during the thumping El Nino of 1998. August 2009 will almost certainly be Australia's warmest August on record. The records or near records just keep coming thick and fast - really doesn't matter where you look almost every thing is heading in the same direction.... At this stage I anticipate 2009 will be (about) the third warmest year on record - for the oceans it make be the warmest. The year to watch is next year which will very likely be the hottest on record. >A word of advice to all people who believe in Global warming....have a read of Heaven and Earth by pilmer. No one will take him on because he is right. 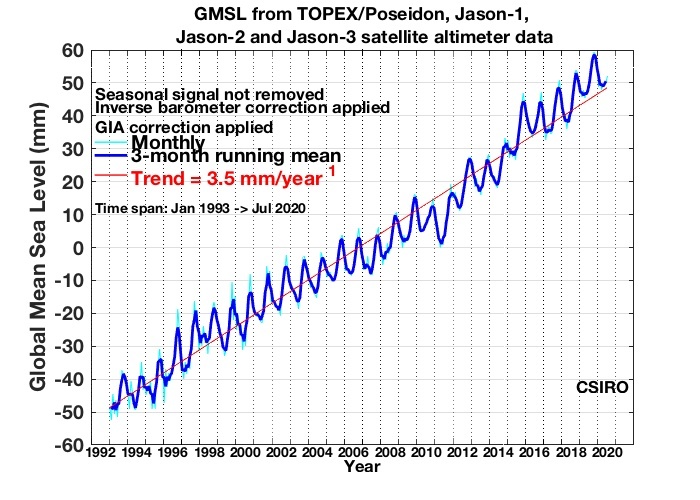 Plimer's book contains a huge number of errors (for example read Ian Enting's review at http://bravenewclimate.files.wordpress.com/2009/04/plimer1a9.pdf). Enting has a Doctor of Science in Mathematics (and was for a long time a climate scientists at CSIRO) and is brilliant. I actually don't think treating climate change as a "science debate" is necessary anymore. Global warming is now so pervasive that you can see it with your own eyes in OZ - longer, hotter, drier droughts, less snow in winter and particularly autumn/spring, worsening fire seasons, more and more out of season heatwaves, rising sea level (with severe erosion evident at so many of our beaches) etc. [quote="hillybilly"]>Havent we cooled every year since 2002? Despite CO2 emissions increasing the planet is cooling...maybe i am just dumb..
3rd warmest year globally DJ?? Or for Australia? Yeah, I think we all just have to accept now that this is happening. It is a tragedy that it had to occur in our lifetimes but the short sightedness of humankind is an unfortunate part of our nature, no one ever cares to think ahead and consider what our actions now in the short term are going to do in the long term. We are all guilty of it IMO, at putting off long term benefit for short term gain. Anyway, well said DJ, this is no longer a scientific debate (or fervent religious debate like it is for some people ), this is happening, it is affecting our lives now and is already greatly responsible for claiming many lives in this state, right in front of our eyes in fact. There is nothing we can do now but learn to adapt to the hardship that our new climate presents us. Can't believe governments are still debating measures for climate change mitigation and many politicians are still in denial. All this whilst we are breaking heat and dry records left right and centre. Johnno globally it will probably come in about 3rd warmest. Turns out the top 5 years are separated by only 0.1C so its a very close run thing. There is an outside chance this will be the warmest year globally but ATM the global land surface temperatures have been dragging down the global average (the oceans have been a record warm levels for the last 2 months - you can see all this warmth in the global sea level data which shows the current seasonal minimum is the highest on record - the image is here - http://www.cmar.csiro.au/sealevel/images/alt_gmsl_seas_not_rem.jpg). To get number one we need to average +0.7C across the globe to years end while in recent months we have been running at about +0.6C. I'd guess that Australia will come in with a top 5 year. The first few months of the year were unremarkable (most just above average) but July was very warm and August has been exceptionally warm. If August's anomalies continued through to year end we could have a top 3 year, but I think that is unlikely at this stage. Because we started 2009 with a La Nina you would expect Australia to have a fairly cool year for 2009 (the 4 coldest year Australia has experience in the last ~15 all started with La Nina's). PS The data I quote for the globe is the NCDC NOAA data (US national weather service). Their data is all free available on the web and they include both poles. Cheers thanks for all that yeah noticed ssts are more higher than normal in most areas as you say its the land temps holding things back abit. Just when we thought things were on the way down last few years interms of temps globally looks like we are on the way up again which I didn't expect. Inadmiisable evidence im afraid for all you sheep....140 years isnt enough. The only unfortunate thing about it all, i would love to be around for the next ice age to see the looks on all your faces. The only extraordinary thing about the temperature record is that it happens to start at the coldest point in the last 5000 years. Being the warmest on record in 180 years when there is a clearly a natural cycle of 800-1500 years is hardly a cause for concern. the cooling since the holocene optimum (3 deg warmer) is! And the clincher, after WWII, CO2 increased dramatically as the industrialised world took off...and we cooled for 32 years in succession. There is no evidence to suggest CO2 has any bearing on temperature...nor will there be. It's an important part of our planet.. I've listen to climate "sceptics" (not a single one of these in Australia is climate scientist) tell me how the scientist have got it wrong for nearly 2 decades... funny thing is that the weather and climate isn't listening to you. Month after month year after year the predictions of scientists are borne out - rising sea levels, less snow, hotter heatwaves, drier droughts, worse bushfires. Quite frankly you two are wasting your time and should move on. The debate has been decided by the weather.